When the idea of Home Information Packs (HIPs) was first mooted way-back in 1997 hopes were high. HIPs were supposed to make the whole home buying process simpler, easier, quicker and ensure that fewer sales broke down. Who could argue with all that? Well plenty of people in the property industry did. For opponents, HIPs were meddling, bureaucratic and potentially costly. "The whole thing has been a mess from the start, ill conceived," says Trevor Kent, former head of the National Association of Estate Agents and anti-HIPs campaigner. "Most sales collapse because someone pulls out of the chain, not because of any information that is set to be contained in the HIP." It was the requirement for homeowners to have a home condition report - a sort of half-way house (no pun intended) between a mortgage valuation and full structural survey - which drew most fire from critics. The homebuyers survey was meant to flag up to potential buyers any structural problems with the property. But if the property did not sell after six months the seller would have to go to the expense of having the home condition report done again. 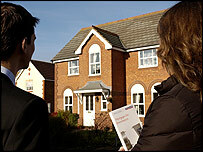 Some estate agents feared would-be sellers would be put off placing their homes on the market. Instead of speeding up the sale process, they argued the scheme could potentially slow things down as mortgage companies still insist on having their own valuations done. Last July, the government did an about turn and dropped the requirement on sellers to have a home condition report in a HIP. As usual with the property market interest groups had a big say. "The idea of HIPs has been nine years in the making. It was in the labour manifesto of 1997 and the Queen's speech of 2001," says Mike Ockenden, director general of the Association of Home Information Pack Providers. "The length of time and the fact we have had six housing ministers allowed opponents to gather their strength. "Estate agents simply did not want anyone meddling in their market and mortgage lenders saw a threat to the fees that they charge buyers for valuing a property," he adds. The government's decision left many people wrong footed; not least those who were planning to train as home condition report inspectors. Many commentators thought that without the key component of the home condition report HIPs would never see the light of day. Nevertheless, what is in effect a "HIP-lite" is set to come into force this summer. From 1 June house sellers will be required to have a HIP containing title deeds, local searches and an energy performance certificate. The big idea of the certificate is that, at a glance, would-be buyers will be able to see the properties energy efficiency - a bit like when buying a fridge - and if there are any planning applications that may endanger their dream move. Energy performance certificates kill two birds with one stone - providing information for homebuyers and ensuring the UK complies with an EU directive which comes into force in 2009. Under the directive all homes have to be energy rated once every 10 years. However, the cost of having a property's energy performance assessed has been estimated at anything from £300 to £600. A specialist energy assessor will be required for the task, and according to Mr Kent there are not enough to go around. "They will need 7,000 assessors to do the job but I have heard on the grapevine they have 1,000, not enough by a long chalk," he said. However, these figures are hotly disputed by Mr Ockenden. "Even at a period of high market activity there will only be a need for 3,000 to 4,000 inspectors," he says. "Remember, Hips are being launched in June when the market is traditionally quiet, there will be enough inspectors to go round." There are also fears that the requirement to include a search in the HIP is flawed. "Local authority searches are only going to remain relevant for a few weeks," Mr Kent said. "No solicitor worth their salt is going to accept a three or four month old search supplied by the buyer. After all, they risk being sued if things go wrong," he added. In addition, lenders told the BBC that they reserve the right to ask borrowers to conduct fresh searches if they feel it necessary. With less than three months to launch, there is still some uncertainty over whether HIPS will go ahead. The government has just finished a fresh consultation and pilot projects are running in six British cities: Newcastle, Southampton, Huddersfield, Northampton, Cambridge and Bath. The overwhelming call from the industry is for the launch of HIPs to be delayed. The Council of Mortgage Lenders (CML) and the Royal Institution of Chartered Surveyors are amongst the leading voices now calling for delay. "There is not enough time to test to see if this system is rigorous enough to work," says Bernard Clarke, a CML spokesman. If HIPs do bite the dust, proponents suggest this could be negative for house buyers. "The house buying system as it stands does not work for buyers and sellers," Mr Ockenden says. "One in 4 transactions fail between offer and completion and the length of time taken to complete is excessive and causes huge stress." Whatever happens though the requirement on homes to be energy assessed has to happen - it is, after all, an EU directive. "The government has said time and again that HIPs are going ahead. I suggest the industry accept this reality and get on with making it work," Mr Ockenden says.